So far in this series I have shown you hopefully how powerful the Replication side of the house is within Veeam Backup & Replication. It is by no means the whole topic covered, we will have CDP as mentioned as a feature, Veeam also have the Veeam Availability Orchestrator which I consider the next level Veeam Replication on Steroids and that alone deserves its own series. There is another form of replication though that in some environments can be driven by Veeam to allow for data to reside in that secondary location. This comes in the form of the storage snapshot integration. 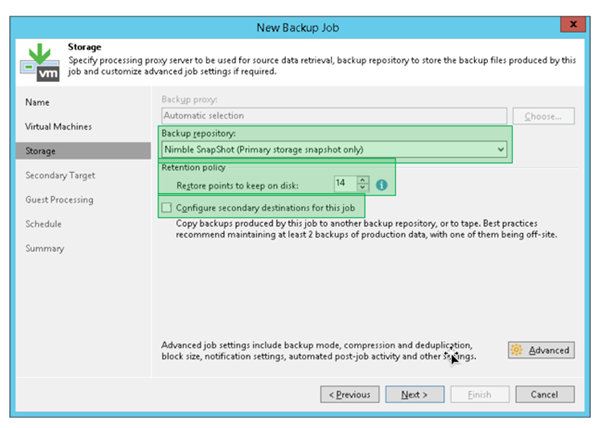 This was also mentioned in regard to transport modes used for your replication jobs but when I see storage snapshot orchestration I mean that Veeam is capable of using the storage replication technology and drive that through the Veeam user interface. 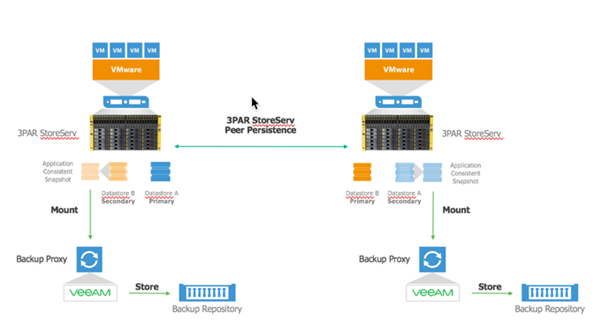 Veeam’s Integration allows Veeam Backup & Replication to sit on top of the storage systems from NetApp & HPE Nimble and control application consistent Snapshots for local fast Recovery Point Objectives. 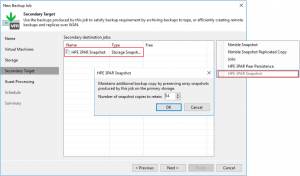 Veeam also enables the ability to orchestrate and schedule those app aware snapshots to be sent to a secondary storage array from the same vendor. We also have similar capabilities with HPE 3PAR with their Peer Persistence replication technology. The screen below one step further also in that we are able to then take a backup of the data from the secondary location. Let’s run through some of the options for all of these firstly how does this look from a HPE Nimble and NetApp point of view. 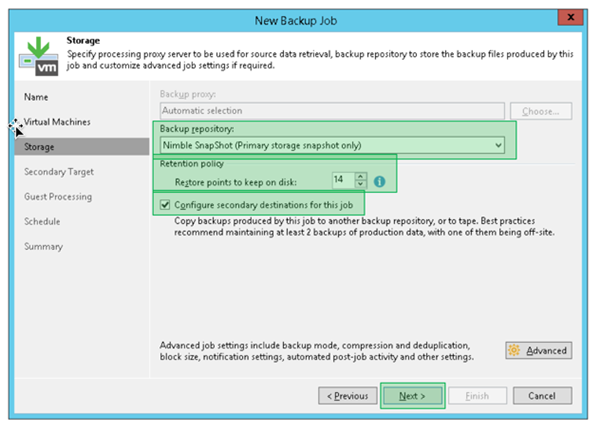 For this orchestration, it’s a backup job first, we need to create a new backup job and this is also after the storage arrays have been configured and added to the console. Notice how from the drop down this allows me to choose a Primary Storage Snapshot. Next, we can select the configure secondary destination for this job. Next, we have the options to choose where the secondary destination should be. It is worth noting that this feature will only talk to the same vendor and model specific i.e HPE Nimble to HPE Nimble and NetApp ONTAP to NetApp ONTAP. All software versions should be checked within the system requirements before attempting this. The retention set here is how many snapshots on the secondary array should we be keeping. When this job runs providing licensing and network replication has been configured on the storage arrays this will orchestrate the storage snapshots and replication to the target location. Is a similar process to the one above, I need to clarify some of the next points though as these were put together during a beta phase. Thanks to Pierre and Niels for their work on the diagrams and screen grabs. 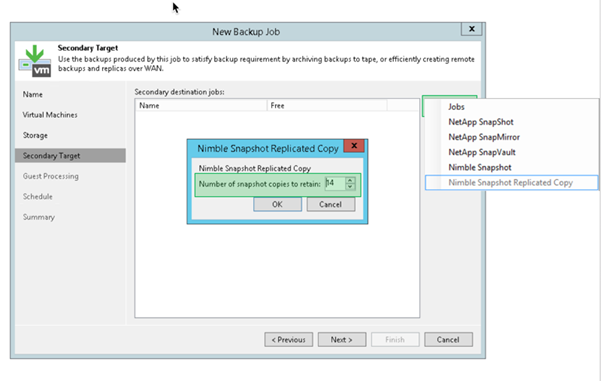 Much the same if we want to leverage the storage replication for that secondary target then we can select the following configuration with the required remote copies of snapshots to keep. 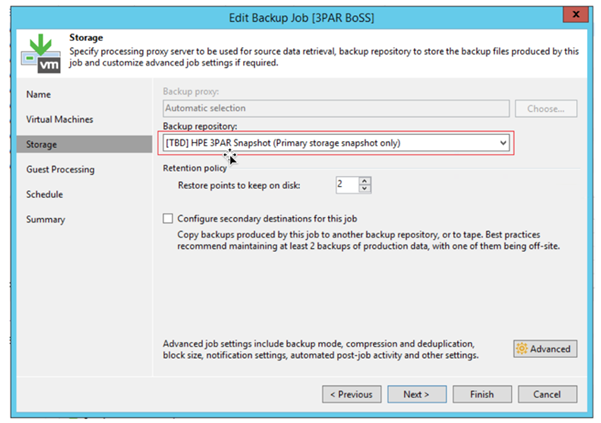 from a recovery point of view, the Veeam explorers can be used for recovery tasks however the failover and failback from Veeam replication will not work.